A grill is a staple on many American patios, yet choosing one has become more complicated than ever. You can choose from charcoal, gas, smoker, natural gas, infrared or electric grills. Choose a portable grill, a small grill, a full-sized grill or have one custom made for your outdoor space. The type and size of grill you choose will depend on how and where you plan on using it. Ranging in price from $99-$699, this brand has gas grills in all sizes, from portable to 6-burner. Some of their grills have infrared technology, giving you several options for preparing your meals. Buy them from The Home Depot. Weber grills are known for their infamous kettle style grill that became popular in the 1950s. Today, they offer consumers an updated version of the kettle grill in addition to gas, electric, portable and smoker grills. Charbroil has been making and selling grills since 1948. They are known for their innovations in grilling technology, including their new Wi-Fi enabled smoker. Traeger Wood Pellet Grills has grown from humble, local beginnings to having products in retailers across the United States. Their outdoor grills are designed to use natural wood pellets to provide flavor to anything they cook. KitchenAid has been improving the dining experience for homeowners since they first introduced their iconic mixer in 1919. Their versatile selection of grills is ideal for homeowners with an outdoor living space. Broil King has been one of the Onward Manufacturing Company’s brands for over two decades. They sell charcoal and gas grills in a full range of sizes, from portable to full-size. Kenmore has been providing homeowners with innovative home technology for over 100 years. Their grills are versatile and range in size, style and functionality. Dyna-Glo specializes in smokers, charcoal and gas grills, which are available online and at national retailers. They also sell accessories such as heat lamps that can help homeowners complete their outdoor living space. DCS by Fisher & Paykel began in the 1980's, where their goal was to bring professional grade appliance to home chefs. The company provides both indoor and outdoor products. Charmglow grills, which are manufactured by Nextgrill, have been around since the 1960s. The grills are now exclusively sold at Home Depot. The size of the grill you buy will depend on several factors. You’ll want a grill that is small enough to easily fit in your space, yet large enough to cook enough food to feed you, your family and any regular guests you anticipate feeding. Tabletop: Electric grills are the only ones available in a convenient tabletop size, making them great for small spaces including apartments, condos and small houses. Single people, couples and small families will find these convenient, especially in the summer since they can cook a full meal without heating up the entire house. Travel size: Many grill enthusiasts like to take their grills with them when they go on trips such as camping. A travel size grill can easily fit into the trunk of a sedan and can be set up quickly. Due to their small size, travel size grills work best for feeding two to four people at a time. Standard: A standard grill size (two to four burners or 360 square inches) works for the majority of people who use their grill regularly and cook for a group of up to six people. A two burner grill can comfortably fit nine hamburgers, while a four burner grill can cook up to 15 at a time. Full size: Full-size grills can be as large as 1200 square inches, which is enough to grill almost 60 four-inch burgers while still leaving them a half inch of space while they cook. These huge grills are ideal for people who regularly entertain large groups and have the outdoor space to fit a full-size grill. Grills have come a long way since the 1950s, when Weber introduced its now notorious kettle grill. Today, kettle grills are still available (with some modern updates), but they are far from your only option when it comes to style. Kettle: Still as popular as ever, the kettle grill is a classic charcoal style that is available from multiple brands. Its closed dome keeps heat in, while some holes on the lid ventilate while you cook. They have wheels for easy transport and are generally a less expensive, though durable, option for small families. Built-in: Perfect for the outdoor chef, built-in grills can be customized to fit into a fully functioning outdoor kitchen. Gas grills are an optimal base for your built-in grill. Once you have found your perfect grill, you can customize it by building in a countertop, shelves, even a dishwasher. If you know what you’re doing, creating a space for a built-in grill can be a DIY project, but it should be left to the professionals if you aren’t very handy and/or your grill will be close to a building. Fireplace: All you really need to grill is fire, and what better place to find fire than your fireplace? A fireplace grill is essentially a cooking grate specially made to be placed in your indoor or outdoor fireplace. You can also find grates that help you grill over campfires. Kamado: Kamado cookers are traditional Japanese cooking stoves fueled by wood or charcoal with a ceramic exterior. Their unique shape allows for all-over cooking, without having to turn food partway through cooking. Kamado style grills can maintain heat up to 750 degrees, and they can be used as a pizza oven and a grill as well as to bake anything that a regular oven could bake. Several brands have their own spin on kamado grills. You don’t necessarily need additional accessories to grill, but they can simplify cooking and enhance your overall grilling experience. The types of accessories you buy will depend on what’s already included with your grill along with how you plan on using your grill. Tools: You will need some basic tools once you start grilling, including a spatula, fork and tongs. You’ll also want a meat thermometer and skewers if you plan on cooking vegetables and small cuts of meat. Grill press: For the grill master who wants to impress, a grill press is the best way to get those perfect grill marks on all your grilled meats. Corn basket: A must for grillers who prefer their corn grilled, a corn basket grills your corn while preventing it from sticking to your grill. Grill brush: A grill brush is a must for keeping your grill clean. These range from simple to ornate platinum brushes. Side burners: Side burners can be an easy way to increase your cooking space and allow you to heat up water or sauces without going back and forth from the kitchen to your outdoor grill. Make sure to buy a side burner that is specially designed for your grill. Grills do more than just sear steak or cook chicken. Advanced technology, accessories and added features have turned grills into the main cooking appliances in many homes. Meat and fish: When people think of grills, they tend to think of cooking meat, such as steak, chicken or sausage. Surf and turf is another popular option. These grilling staples have helped make grills part of America’s tradition. The type of meat or fish you cook the most could factor in to which type of grill you end up buying. Sauces: Accessories like side burners make it easy and convenient to cook a sauce for your steak at the same time that you grill your steak. Sides: From baked potatoes to corn on the cob, grills are a quick and easy way to heat up your sides so they’re ready when your meat is. Additions like a corn basket can prevent sticking, or you keep things simple by wrapping your veggies in good old fashioned aluminum foil. Desserts: Desserts aren’t just for the oven anymore. Use your grill to bake anything from fruit to cookies. Grills are great for cooking, but they also represent a potential safety hazard if you don’t take the right precautions. Create distance from your house: Your grill should have at least two feet of clearance on each side. If you have a small patio or outdoor space, you will need to get a small enough grill to give you the clearance you need. Flat surface: Always place your grill on a flat surface, whether it’s an outdoor or indoor grill. Fire extinguisher: Every home should have a fire extinguisher, especially if you have an outdoor grill. Keep it close by your grill to make it easy to put out any fires before they get out of control. 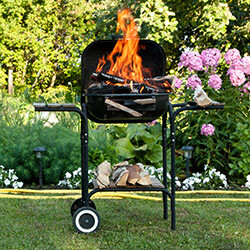 Grease fires: It is so important to clean your grill after every use to get rid of grease that can cause grease fires. It doesn’t take long for grease to build up in your grill, and it can quickly accumulate after only a few uses. Keep kids away: Kids love to play outside, but make sure your grill is somewhere that is not easily accessible or inviting to your kids or any young guests. Always have an adult supervising outdoor play when your grill is hot. How much does a grill cost? There’s a wide range of prices for grills, from as low as $20 all the way up to $10,000+. While quality and cost are not necessarily directly correlated, a higher priced grill is likely to include more settings and amenities than your bare-bones $20 grill. A higher priced grill isn’t always the most practical or the highest quality. Here are some things that affect the cost of a grill. Type: The purchase price of a charcoal grill is typically less than a gas grill. However, the price per use is higher for a charcoal grill than a gas one, since you need to buy charcoal every time you use a charcoal grill, versus filling up with propane once for multiple uses on a propane gas grill. 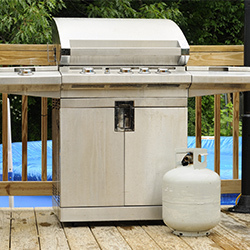 A natural gas grill will cost more than a propane grill. Size: In general, a smaller grill will have a smaller price tag. Table top grills, travel grills and other portable grills will cost less than standard or full-size grills that are made out of the same material and are of the same type. Material: The material that a grill is comprised of will make a big difference in how much it costs. Stainless steel grills, for instance, will cost more than grills made out of cast aluminum or plastic. Extras: Some grills come with cool built-in features like a rotisserie, smoker, enclosed wheel cart or infrared burner. These features cost extra money up front. Most of these features can be added on later if you want to upgrade your grilling space without buying a completely new grill. What are different types of grills? Nexgrill has gas grills for every kind of grillmaster. Whether you enjoy traditional favorites like burgers and hot dogs or are more of an experimental chef, you can find a Nexgrill to meet your needs. Sizes range from portable table to grills to 6-burner grills that can feed a crowd. Weber grills have been around since the 1950s when their infamous kettle style grill became the hit of suburban backyard cookouts. Since then, Weber has continued to innovate and improve the grilling experience. Today, they offer consumers a wide range of grills including gas, electric, travel size, smokers and, of course, the kettle-style charcoal grill. Charbroil has been making and selling grills since 1948 and have been working ever since to make grilling even easier and more affordable. The company began by selling charcoal grills, but today they make a variety of types of grills, including the innovative Wi-Fi enabled smoker. 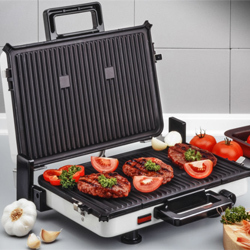 Innovating isn’t new to Charbroill; over the last six decades they have introduced several new types of grilling to America, including portable, electric and gas with electric ignition grilling. A household name for over 100 years, Kenmore has been improving the lives of people across the country with their innovative technology. Their grills range in size from small space/patio to five burner, many with added features such as fold-down shelves, back lights, built-in refrigerators and side burners. On a mission to put an end to flare-ups once and for all, Brad Holland developed the “Holland system” of grilling nearly 30 years ago in North Carolina. His system is a patented system of heat control guards and a sizzle tray designed to prevent flare-ups while grilling so you get all the flavor of grilling without the danger. It’s unique drum shape means food gets cooked on all sides at the same time-no need to flip or use a rotisserie. Holland grills are available at retailers across the U.S. and Canada or online. Dyna-Glo is one of many brands sold by GHP Group, Inc. The company is a leader in both indoor and outdoor living, selling products that include grills, patio heat lamps and fire pits. Dyna-Glo grills and smokers are available online and at retailers nationwide. Napoleon’s history dates back to 1976, when Wolfgang Schroeter first produced a wood stove in Ontario, Canada. Today, Napoleon has expanded to produced luxury gas and infrared grills. Napoleon continues to innovate new designs by listening to customer feedback and continually advancing their technology. Although they are based in Canada, Napoleon grills are available worldwide online or through one of their several international selling partners. High-end grills: Napoleon features luxury gas and infrared grills for consumers who want their grills to come with all the bells and whistles. Outdoor living: Personalize your outdoor living space by buying your grill, heating lamp, island kitchens and built-in components from Napoleon. Range of sizes: From travel size to full-size to built-in, Napoleon has a grill for every outdoor living space and every traveler. Portable accessories: Napoleon sells accessories for all of their grills, including their travel/portable size grills. These include a cast iron portable griddle, cover, tote bag, warming rack, stand and more. 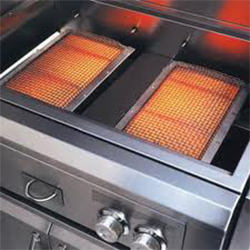 Infrared burner availability: Infrared burners are relatively new on the grilling scene, and Napoleon has them available in sizes ranging from two to seven burners. They are available as stand-alone grills or as built-ins, so you can customize your living space however you want. Best for: Napoleon grills are best for high-end homeowners and travelers. Hasty-Bake is one of the original grill manufacturers, having produced the Hasty-Bake charcoal oven in 1948. After over 60 years in the industry, the basic design of the Hasty-Bake charcoal oven remains remarkably the same, although the company has made some innovations including introducing the first portable unit, the first hooded unit and a new method of cooking using indirect heat. While it’s a charcoal grill, the Hasty-Bake also gives chefs the option to bake or smoke their meals. KitchenAid got their start selling their iconic mixer in 1919. Today, KitchenAid is a major distributor of indoor and outdoor household appliances. Their grills are manufactured in partnership with Nexgrill Industries, Inc. and can be found at retailers nationwide. Hamilton Beach specializes in indoor home accessories. Their budget-friendly indoor portable grills are ideal for small spaces and traveling. The patented Holland system has been around for nearly 30 years. This system eliminates flare-ups to produce a great grilling experience without the hazard. BBQTek has been providing customers across North America with grills and accessories since it was founded in 1982. The company offers propane grills, natural gas grills and charcoal grills. Hasty Bake first produced their Hasty Bake oven in 1948. 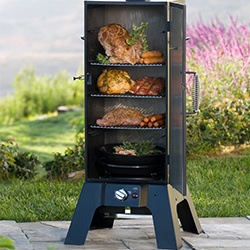 Their basic design remains the same, but they have added innovative upgrades, including the option for grillers to smoke or bake their meat using their charcoal oven. Vermont Castings has been making eco-friendly fireplaces and wood-burning stoves for over 35 years. Their cast iron products are designed for maximum heating efficiency without sacrificing style and detail. Napoleon’s history making grills dates back to 1976 when their founder first produced a wood stove. Today, the company specializes in luxury grills that can complete any outdoor living space in style.